Is homework an essential component of rigorous schooling or a harmful practice that alienates and discourages a significant number of students? 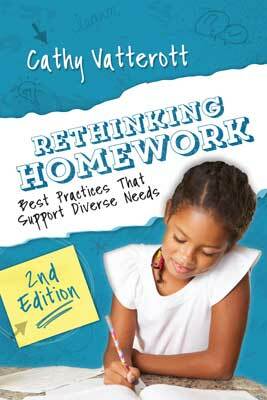 Nine years after Rethinking Homework: Best Practices That Support Diverse Needs was published, the debate over this complex question endures. In this updated edition, Cathy Vatterott examines the role homework has played in the culture of schooling over the years; how such factors as family life, the media, and "homework gap" issues based on shifting demographics have affected the homework controversy; and what recent research as well as common sense tell us about the effects of homework on student learning. She also explores how the current homework debate has been reshaped by forces including the Common Core, a pervasive media and technology presence, the mass hysteria of "achievement culture," and the increasing shift to standards-based and formative assessment. Numerous examples from teachers and schools illustrate the new paradigm in action, and readers will find useful new tools to start them on their own journey. The end product is homework that works—for all students, at all levels. Cathy Vatterott is a professor of education at the University of Missouri–St. Louis, where she trains preservice middle school teachers. She is a former middle school and high school teacher and middle school principal. Vatterott is considered an international expert on the topic of K–12 homework.